Happy Friday! Today I have a very simple but addictive appetizer that would be perfect for a holiday meal. What I love about this recipe is that you can prep all of the vegetables up to a few days before hand to save on time. Load it up with lots and lots of vegetables and enjoy! 1. Mix the mayo, sour cream and ranch dressing in a large bowl. 2. 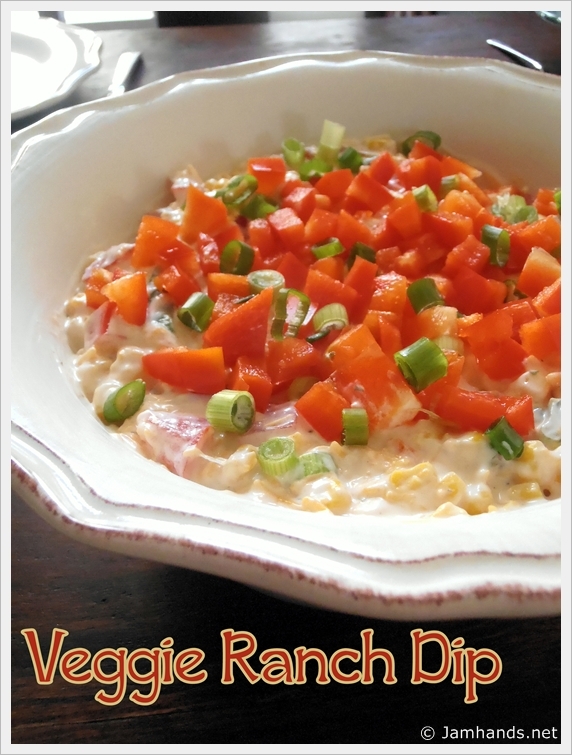 Add the corn, tomatoes, peppers, green onions and cheese to the ranch mixture, reserving some veggies for garnish. 3. Add to your serving dish and garnish with chopped vegetables. Serve with crackers or Frito Scoops chips. Yum, definitely will try this one... pinned!